Harry Eberhardt’s boss, magician Amelia Laveau, has just had her skull bashed in by a lamp wielded by a demon-possessed murderer. And she’s one of the best demon killers in the country. Harry’s seductive visions of success are about to suffer a severe blow. It appears that the Office of Occult Affairs is going to have to put out a sign reading “Needed: better magicians,” in chapter 6 of Magician’s Misfortune, my weekly serial about the nation’s magicians confronting a serial killer demon. This entry was posted in Magician's Misfortune, Writing fiction and tagged cruelly humorous doctor, demon, fantasy, Fiction, Magic, supernatural, Writing. Bookmark the permalink. is that a turban upon her head? Or has she just washed her hair? Though I reckon artistically it’s there to balance her generous frontage. Ah, those wonderful corsets! 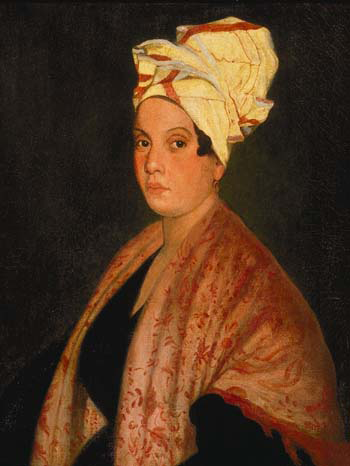 Marie is a nebulous figure in New Orleans history, more legend than fact, though she seems to have really existed, at least. Since she was a Creole of mixed race, other possibilities are that it could be modesty, or it could be covering up the evidence of her ancestry when she moved in polite society.